I spent my entire pregnancy reading several books for expectant moms. Had there been a theory exam on pregnancy and child birth, I would have scored distinction for sure! But the moment my daughter arrived, reading has been least of my priorities! 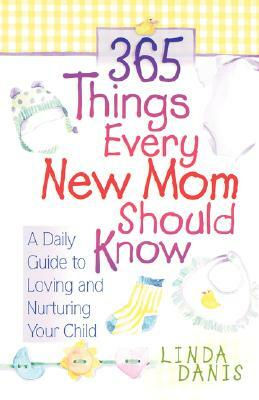 Recently, my mom sent me a book – 365 Things Every New Mom Should Know by Linda Danis. I did not open the book for almost a week, fearing it would be page after page of long, boring list of advises. It was one of those rare afternoons.. I had finished all my chores and I had absolutely nothing to do, not even browse the internet due to a powercut, I was left with no choice but to read the book. The minute I started reading it, I really regretted wasting a week not reading it. It is a daily reading with just one paragraph or two to read everyday about your new born until he/she turns one. It is so simple and powerful. The entire book is filled with nuggets of priceless wisdom on how you can bond with your baby. It is packed with games, songs and fun activities that you can do with your little one. At the end of each chapter there is a short heartfelt prayer that equips you for the entire day. Though my daughter is a year and half now and it might be a little too late for me to be reading it, I am still learning a lot from this book. Better late than never, isn’t it?! I am still not through with the book. But since it is so impacting, I felt I should not waste any time informing every new mom on what a blessing this book could be. If your baby is under a year, buy it now and make the most of all the wisdom that’s shared in it. If you are not a new mom, but you do a friend who is one, gift this book along with all the cute clothes you are planning to gift. Trust me, your friend will value this the most! You can either buy the book on Amazon or find it in any Christian book store! Children truly are bundles of joy. But there can be moments they stress you out too. It is at such moments divine wisdom grants all the grace you need to handle the stress! Previous PostFirst Three Word Sentence!! !Next PostOur First Step Towards Getting Crafty! Im happy that the bookll b more useful to many.